The street food (known as hawker food) of Singapore is bar none, one of the top three in the world. You can get it everywhere (40,000 licensed food stalls!) and in variations that will astound you. Consider the ethnic mix of Chinese, Indian and Malay and you have an idea of the depth and breadth of spicy food available. Common hawker foods include the ubiquitous Malaysian satay and nasi lemak (coconut rice topped with chicken and fried fish), the Indian roti prata (curry in a pancake), and the Chinese kway teow (fried flat rice noodles) or Hainanese chicken rice. You must also try the multicoloured desserts such as chendol (coconut-type dessert filled with green screwpine-flavoured bits). 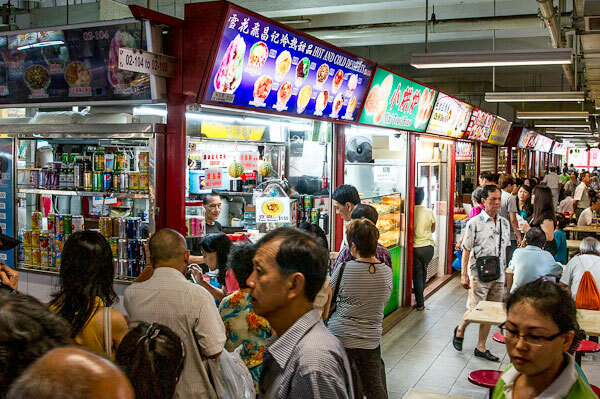 Most of this magnificent food is available for as little as $3 in the city’s 100 food centres such as the Chomp Chomp Food Centre, the seafood-loving Newton Circus Food Centre and the Lau Pa Sat Food Centre. I can’t talk about the street food in Singapore without mentioning a terrific resource: Makansutra (“Makan” means “eat” in the Bahasa language while “sutra” is guide or lesson in Sanskrit). K.F Seetoh decided he would create a guide to the fabulous hawker food of the country and his first Makansutra book had 700 listings. It was so popular, that his original enterprise has just produced its sixth edition, spawning separate Malaysian and Indonesian guides, a television show and most importantly, guided “food safaris” of hawker food (Off The Beaten Track, Uniquely Singapore or the Midnight Tour). Go to the website and you’ll even find a do-it-yourself safari listing recommendations for breakfast, lunch and dinner. Makansutra has wrapped up four seasons on the Asian Food Channel. 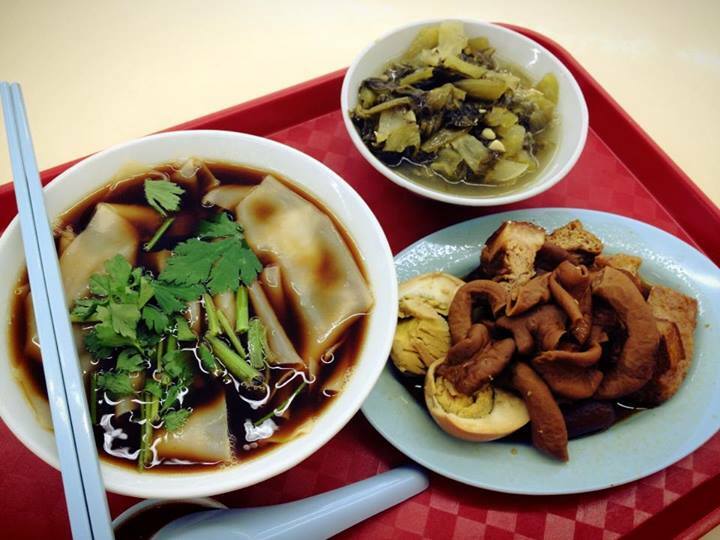 I asked my friend Mark, who spent a chunk of his formative years in the city state, to provide some of his thoughts about the hawker food. He points out that since Singapore is surrounded by Malaysia, it’s only natural it has representations of foods from all over Malaysia and its own version of that food type. Kway Chap - Pigs internal organs boiled in Soy Sauce. Disgusting I know but delicious. Usually served with large flat noodles. 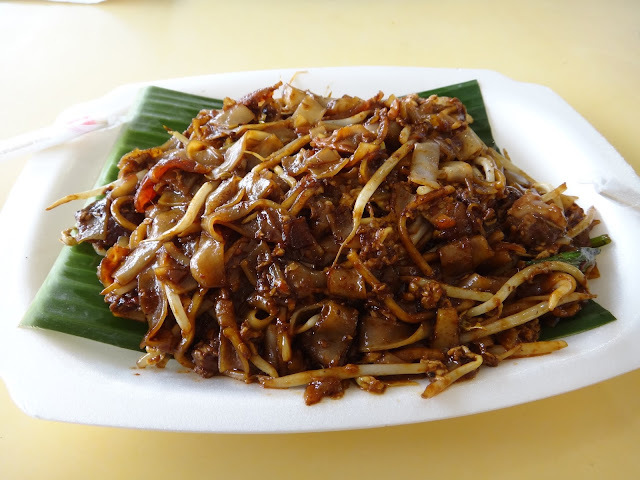 Char Kway Teow (Singapore version) - Flat rice noodle stir-fried in sweet soy sauce with garlic, lard, shrimp, cockles, bean spout and fish cakes. 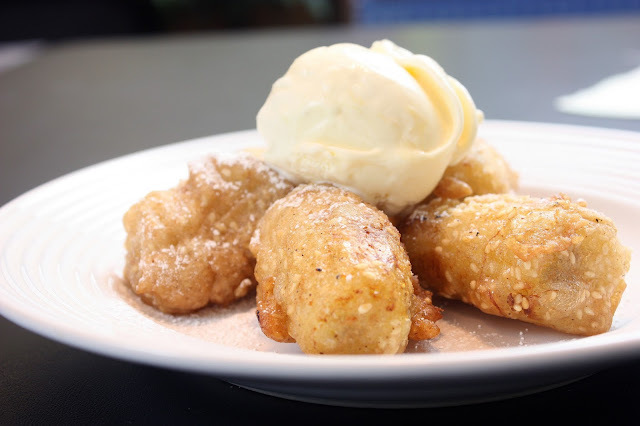 Banana fritters - Battered bananas deep-fried in oil to give a crunchy exterior but still maintaining the sweet, moist and fragrant interior of the banana. Ice Kacang (Singapore version) – A mountain of finely shaved ice drizzled with various sweet syrups and evaporated milk in a bowl of red beans, jelly, tapioca and sweet corn. NOTE: For those of you in Toronto this week, I encourage you to attend the Reel Asian International Film Festival , on until Nov. 19. As you might guess, films are also a pathway into a culture (and its food). I have seen the exuberant, experimental documentary "Singapore Gaga." This 54-minute gem gives bloom to the diverse denizens of Singapore: from the antics of a clog-dancing juggler to a subway announcer’s explanation of “Singlish” (Singapore English) to a gentle Polish waltz duet by a Chinese harmonica player and an Indian guitar strummer. A bit off-kilter but a mesmerizing ride through its culture.